Stay up to date with mainly music Arrowtown on their facebook page. Young children develop skills – co-ordination, fine motor movements, large motor movements, social interaction, appreciation of music and musical styles, and language development. 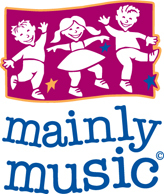 mainly music provides children with a structured learning environment and then a time of free play. mainly music brings adult and child together for a time of safe interaction, and in doing so, teaching adults rhymes and songs that can be used at home to help with cleaning up, colours, counting, and more. There is an opportunity for parents to network with other parents of young children. Some groups stage additional events to encourage family fun. In short, mainly music is an opportunity for adults and young children to build memories and spend time together, sharing special time with each other is the aim of mainly music. Each week, parents and caregivers bring their children for a thirty-minute session of music, rhyme, movement, listening and more. 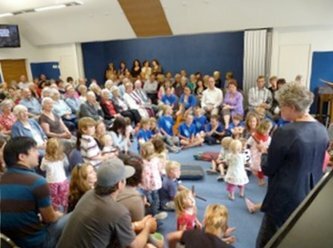 The adults must participate in the session, and in fact, it is vital that they do so, because this encourages the children to enter into the actions and singing. At this session, adults and children are given snacks and refreshments. This allows time for children to enjoy each other’s company, and to develop social skills. It also allows those adults who don’t have a wide circle of friends to be introduced to others who have young children and they are therefore able to support each other. Click here for more information.